How “fixing” the Zestimate isn’t just math – Notorious R.O.B. Then I suggested he send the million dollars to the Beverly Hills/ Greater Los Angeles Association of REALTORS® – where yes, I am the CEO, and yes I am technically a paid cheerleader for the industry. Despite all of that – as well as my nature to be a smartass – I stand by my statement. Every property – be it a space in a building, or a stand alone home – is different. From the orientation of the lot which can be affected by wind and rain patterns that wear differently on a property to the maintenance of a given room in a given unit, the smallest differences can vastly affect the valuation of that unit or property. What side of the property is oriented for stormwater drainage? Is the crack in the upper corner of a room likely to indicate a broken slab from drainage or just poor maintenance/ installation of drywall? Does that same crack run a higher or lower risk of letting moisture seep into the walls? Does that moisture leak indicate a likely mold problem? Is that likely mold problem a small problem, or one that could require major remediation? And that represents just one crack on one wall in one room of one unit on one property that can not be seen from a plot map and a satellite picture taken some time in the last six or so months. How Exposed Do Consumers Want To Be? Even the most complex algorithm can not bring into account what a professional intuitively knows about the conditions of a property. They’ve gained this expertise by spending time in countless properties, and being able to identify similarities to conditions found in recently closed comparable properties. A truly invasive collection and association of consumer data, data available through APIs with as many other property related apps as possible, collecting all available government recorded information, recent photography/ video evidence, complex scenario modeling and AI to address concerns – and then local service market information to factor repair costs. While I applaud Mr. Rascoff and the Zillow team for trying to deliver a better product to the consumer, Zillow should focus on their core value is in the marketplace – connecting the consumers with reliable information and qualified professionals to serve their needs. Attempts to replicate or replace expertise with an impossibly incomplete picture of a property only serves to further create confusion and distrust with consumers by giving them unreliable and inaccurate information that contradicts thorough and adequate evaluation. When it comes to the largest purchase that the average person makes in their life – that is an irresponsible if not dangerous course to chart. Very cool for an association CEO to post here. Thank you for contributing Chip. We should not take any technology company seriously if innovation is not its primary driving force. This makes me more concerned about everyone else in the space who isn’t trying new things than it has me worried about Zillow. At least we know they’re committed and legit and real. It’s their duty, simply by existing, to make great consumer experiences. Sometimes agents will be included in those and sometimes they won’t. The press release about the Zestimate contest and the fodder it created afterward just further solidifies its place as the single greatest innovation in modern real estate. I agree that a professional can shed the most light about the viability, strategy, and pricing of a home. It’s my duty working at a brokerage to make sure we find ways to communicate just that. But it’s my wish as a human to live in a world centered on continuous improvement. The Zestimate should evolve. What’s unknown at this point is how those entrenched in the industry will. The market decides which products and services will thrive, not its gatekeepers. To Greg -” The press release about the Zestimate contest and the fodder it created afterward just further solidifies its place as the single greatest innovation in modern real estate.” And innovation can be good and bad. The Zestimate is bad. Very bad. And until it is done away with, my listings will not appear on Z.com, T.com and R.com will not have my listings. Greg – Apparently you are in love with Z.com, so defend this: Vacant 14 acres in town for SFR $426,00. The Zestimate comps were all homes on 1/4 ACRE LOTS AT $220,000. Now, can any Z.com believer defend that? It’s perfectly valid argument to say a Realtor can and will come up with a better price for a home than a completely automated algorithm because… of course they will. All of the intangibles will be factored in, years of hard fought experience will be brought to bare, and time will be invested in coming up with a reasoned determination of value, with one’s reputation attached as additional collateral. But to say that all Realtors (and all appraisers) will be more right all of the time, on all of the listings, and provide a more consistent experience… well, now you’re creeping into an area where Zillow brings value that the collective Realtor army does NOT. The fact that there is such a huge “Raise the Bar” conversation going on (primarily an INTERNAL one!) about the industry and the profession at large is precisely one of the reasons why Zillow can exist and will continue to thrive. You can come up with 10,000 anecdotal listings to show how terrible the Zestimate is, but you can also come up with just as many that will be really close to the final closing price. Unfortunately, for every truly great Realtor out there you’ve gotta wade through at least 4 who are – at best – NOT so great. The Zestimate is a straw man, being attacked by hundreds of thousands of agents, many of whom know – but never discuss – that they don’t actually provide this fabled service and professionalism and expertise. 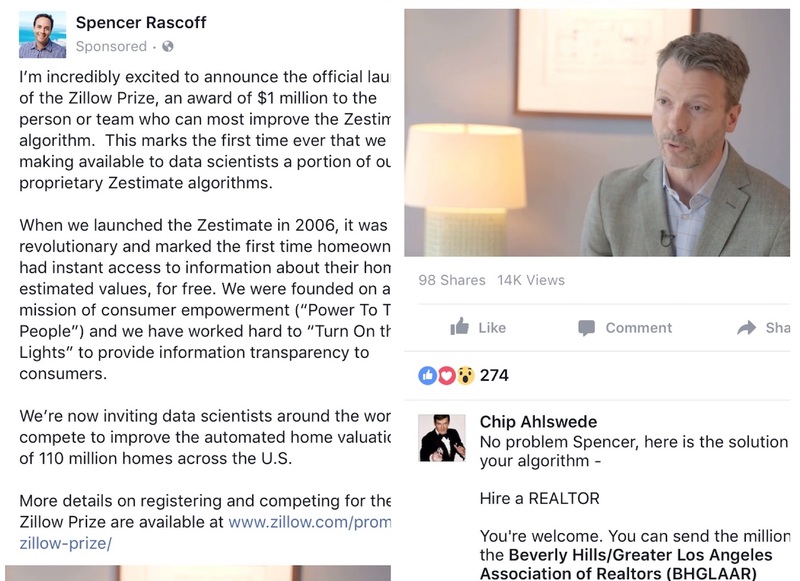 Zillow flat out discloses that their algorithm based on patterns and assumptions and guesswork and that it is NOT a replacement for the diligence that people need to do when buying or selling a home. What is far more dangerous, in my book, is people entrusting nearly 90% of their net worth to someone who has a blue R pin on their lapel and nothing between their ears other than greed and cotton candy. Let’s see NAR post a million dollar bounty to fix the barrier to entry problem and put out a press release about “Help us Eliminate the Bottom Half of our Dues Paying Membership Base” and then we can talk about which industry forces are truly irresponsible here. RSH~ where do I start? First, thanks for letting Chip contribute here, although, I do miss the “always” fitting music clips that coincide with the content! It would have been interesting to see what music content you would have injected. I also would love to know what side of the fence you stand when it comes to this subject? Besides the two “very important” issues I mention, there’s the whole “getting into the Realtor’s lane.” Providing a CMA is a vital role Realtor’s play, and Zillow continually looks to take that vital role away. Marvin show’s all of us just how inaccurate and awful Zestimates can be, and I have one, as well! The Zestimate (today) for 1461 Bryant DR E Long Beach, CA. is $1.75 million, the home just appraised for $3.8 million. And then there’s the recent home sale of Spencer Rascoff. ” On February 29, Rascoff sold a Seattle home for $1.05 million, 40 percent less than the Zestimate of $1.75 million.” The way I see it – that kind of bias manipulation seems criminal! You guys have lost your collective minds the true price of anything is what some is willing to pay for it that is a simple explanation of how a market works I have had 3 appraisals done on the same property with 3 different values from the appraiser’s,this concern with the Zestimate is not important do you want the US Govt determini real real estate values by fiat. Giving an estimate on Real estate in general is not easy at all.I have been in many transactions and were given from different banks many different price opinion.The real issue here is not about consumer experience or to make the transaction faster as you and Zillow describes it. The real issue here is that Zillow and its ideas want to eliminate the agent from the transaction.The average consumer does not want it! The average consumer wants to use a real estate agent.Technology should empower real estate agents and not to eliminate them.The real problem with the pace of closing, are the banks with their regulations when it comes to loans.it is not up to the agents. You couldn’t be more incorrect when you say, “The real issue here is that Zillow and its ideas want to eliminate the agent from the transaction.” Nothing could be further from the truth. And according to the NAR’s data, more people use an agent today than did when Zillow launched 11 years ago. If we want to “eliminate the agent from the transaction” then we’re doing a pretty bad job of that. But of course we don’t want to eliminate the agent. Quite the contrary. We spend significant resources helping agents that advertise with us be more successful. Bashing Zillow is practically a sport for some. And as I’ve said, probably thousands of times, that’s fine — everyone is entitled to an opinion. But bashing with a statement as nonsensical as “Zillow wants to eliminate their paying customers” is really quite absurd. Anyone good programmer can write an algorithm for property valuation estimate and implement it on a website. But the big question is, what it really worth? Property estimate valuation cannot be even close to reality if using algorithm. Those companies who provide property data information, did not actually visited the property in person and their information is misleading the public .Only those Real-estate professionals who personally visited the subject property, can submit a price opinion. All price opinions submitted by real estate professionals should be based on facts-only. Bravo Chip for saying it as it is!! Simple fix… It’s our industry, our area’s and we know the true values of the properties. The REALTOR should always be the center of the transaction. Jay from Zillow Group here. First, thanks Chip for your thoughts and insights. And thanks to Rob for offering up his platform. It seems some in the comments want to banter around some grossly inaccurate Zestimates. And that’s fine, everyone is entitled to an opinion. We could all play games and toss accurate and inaccurate Zestimates back and forth. But what purpose would that serve? There is a reason it’s called a “Zestimate” and not a “Zappraisal” or a “ZalesPrice” — it is an estimate, and not an appraisal or a sales price. No one is expecting the Zestimate (or any of the dozens of other AVMs out there) to replace a real estate professionals opinion of value–either now or when this contest ends in 2019. As we state, literally millions of times on the site, the Zestimate is a starting point, and not a replacement for a pro’s opinion of value. I don’t think anyone here expects this contest to produce an algorithm with an error rate of 0.0%. That’s simply not realistic. We publish Zestimate accuracy down to the county level. (Unlike many AVM providers, which include several big name real estate brokerage franchises, that don’t publicly disclose their AVM’s accuracy.) I think it would be interesting to see agents publish their pricing accuracy, something I’ve yet to see anyone do. What I do see a LOT of is agents talking about how to get their clients to reduce the price of their home. Many even include “price reduction schedules” in their listing agreements. Why would either of those be necessary if the home was perfectly priced to begin with? I think the answer lies in what Varestatebroker alludes to in their comment — the true value of a home is what a ready, willing and able buyer will pay for it. Pricing a home isn’t easy. It’s not easy to do with an algorithm, and it’s not easy for a real estate pro with open access to the property. Ask five appraisers for an opinion of value, and you’re likely to get five different numbers. Ditto if you ask five agents to do a CMA. Ditto again if you ask five qualified buyers what they feel a home is worth. That doesn’t mean the appraisers or the agents (or the buyers) are “wrong.” What it means is that no one really knows what each and every ready, willing and able buyer feels a particular home is worth. And a data science contest isn’t going to change that. Bottom line is putting a “Z” in front of the word “estimate” doesn’t change the meaning of the word. And it will still be an estimate, long after this contest is over. Jay ~ with all due respect “wow” the lens you see through is something else. “It seems some in the comments want to banter around some grossly inaccurate Zestimates. And that’s fine, everyone is entitled to an opinion.” No, Jay, the grossly inaccurate Zestimates are not opinions, they’re facts. Just as the accurate Zestimates you eluded to are facts, as well! It amazes me that you and Zillow are fine with the countless grossly inaccurate Zestimates that Zillow imposes on millions of homeowners without consent. And Jay, you’re right – pricing a home isn’t easy, especially when you haven’t walked the property. And since pricing a home isn’t easy, and because using an algorithm is more or less throwing darts in the dark – Zillow needs to stop doing it. But since Zillow is so adamant about imposing “without consent” senseless Zestimates on millions of unsuspecting homeowners – I for one hope the class action lawsuit stops Zillow in their tracks and does exactly that! I tried to get the Zestimate on my personal home closer to its real value. My CMA showed about 30k more than Zillow. We are in a slow market and comps are tough to get even for the agents who know the market. After adding all of the great features and upgrades to my home on the “claim you home” page, the value actually went down by over 8K! It still hasn’t recovered. A few days later, one of my Broker friends called and said he had a request from Zillow to do a market analysis for me. We had a good laugh over the ordeal and he offered me cash if I would sell for the Zillow price. I’m not a big fan but not afraid of Zillow either. That is where the public is going right now.